Take a deep breath and relax is so common a mantra that most of us miss its core message. Sustaining Life – the oxygen you take in is picked up by the hemoglobin in the blood and distributed to all of the body’s trillions of cells where it is then used to fuel the cells and release energy. Cleansing inner body systems – balancing levels of Ph, CO2 & O2 for normal body functioning. During stressful situations we rarely notice how the pressures of the moment keeps our mind occupied on almost everything but our physiological function – breathing. Consequently leading to irregular and short breaths leaving us in an unhealthy state of being. When we are in this state our mental and physical state diminishes leading to unsound decisions, behaviour and heightened anxiety states. By becoming aware of this and practicing correct breath technique, stressful situations may be handled better and your overall mental and physical health will be improved. “If I had to limit my advice on healthier living to just one tip, it would be simply to learn how to breathe correctly.” – Andrew Weil, M.D. Breathe through your belly not your chest! Breathing properly starts at your belly. Not your chest. Alveoli, where gas exchange occurs between oxygen & your blood supply, are more densly packed at the bottom of your lungs. Chest breathing is shallow breathing and mobalises the top part of your lungs leading to less oxygen consumed by your body. Using your belly helps move the diaphragm (helpful for breathing and respiration) like a pump pulling & squizzing the lungs. This gets more oxygen into your blood supply and ultimately into your body. 1. Inhale in through your nose all the way down to the bottom of the belly for 4 seconds (ratio 1-4-2). Let the belly rise. You may hold your hand on your belly to make sure you are breathing properly letting your belly rise. 2. Hold for 16 seconds (ratio 1-4-2). 3. Exhale out through parted lips (ratio 1-4-2) for 8 seconds. Your belly should fall back down. 4. Repeat steps 1-3, 10 times, 3 times a day. This technique of breathing through your belly is often refered to as Diaphragmatic breathing and used to treat hyperventilation and high levels of anxiety. We should all aim to walk at least 30 minutes per day. Walking stimulates your lymphatic system to move toxins out of your body and is also a great way to burn those unwanted calories. Add a correct breathing technique to this and you are on your way to a healthier you. While walking you can vary your breathing pattern so that you inhale using short breaths 4 times in a row for each step you take and exhale 4 times for each step. Do this for around 15 minutes and it will change your current mental state. There is a University research article which described these 4×4 technique – I’ll try to locate it and update this post soon. You may be thinking, but Ernest do I have to always conentrate on my breathing. I already have a busy schedule… Like most things in life, there is a solution. Research has shown that it takes 21 days to form a new habit. So if you practise this breathing technique “daily” for around 30 minutes, after 21 days this new habit will became an automatic routine. Just like learning to drive a car required effort at first before it too became an automatic routine. So, change your life today and start feeling better and full of energy – Breath. Welcome back for more juice on Flotation Tanks. If you have not read my previous post “Floatation (isolation) Tank – fringe science?” then I highly recommend you go there first and read the introduction to understand what they are, the benefits of the experience and see some screenshots of tanks I’ve been in, in Sydney (Australia) and San Francisco (USA). 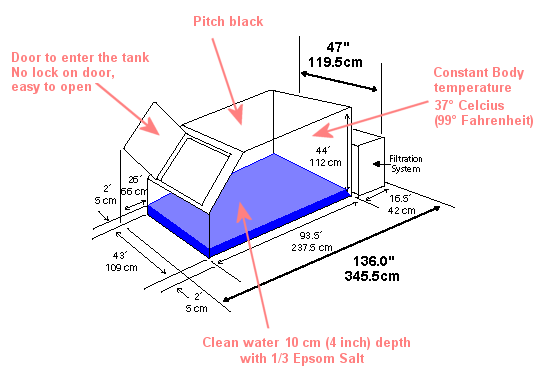 The tank is not airtight – it is designed to let air in via the roof. It’s pitch black inside. Used to disassociate your visual senses from the environment. The tank environment is humid – 37° celcius (99° Fahrenheit) – your body’s temperature. Helps with disassociating your kinestatic senses from the environment. Around 10 inches of water in the tank with 800 lbs. of Epsom Salt dissolved in it. When you lie back you will float like a cork. Your ears will be under water. All places I’ve been to provide you earplugs. Use them to cut out all remnants of noise. That’s how your auditory senses are disassociated from the environment. Keep the salt out of your eyes. Once inside do not rub your eyes or touch your face – the salt is very strong and even a small drop will sting. Make sure you have a towel near the tank to dry your hands before touching your face / eyes. The same goes for any cuts you have on your body. Make sure you cover them up with Vaseline or similar to stop the salt from entering the wound. At the beginning of each float set an intention for what you would like to accomplish during your float. Then enjoy the float – the rest of the journey your mind will take you through. The following is based on my experience. Each experience varies but they all share similar stories. First 20 minutes is calming down your mind and relaxing your body. First timers will find it strange to let go at first because being buoyant is a strange feeling and letting go of tension without touching anything in the tank is even stranger – yes you do float in the tank without touching the bottom or the side walls. When the tension pain is gone that’s when you have fully let go (especially neck muscles). Concentrate on your breathing – in through your nose and out through your mouth. Try this approach, 4 seconds in, hold for another 4 seconds and 2 seconds out (I will cover breathing techniques in a future post and why doing it correctly is super important). Also try to resist moving or scratching an itch. During the start of a meditation session when your senses are slowly being turned off, your brain will send signals to your body to try to awaken them – this will come through as an itch or a muscle twitch. Resist it for couple of minutes and it will pass. Concentrating on your breathing will also help you with the fight against the “monkey mind”. The monkey mind are random distracting thoughts which rush in and out of your mind. After 20 (or so) minutes have passed you will find yourself in an open minded state. Your mind should feel clear & open, your body free of tension. This is the relaxed state. Your mind will be in a frequency state called Alpha. A state which you can also use for accelerated learning. After another 20 minutes (40 minutes into the float) you will enter Theta state. You will be conscious in this state and know when it comes. In this state your subconscious mind awakens and your concious mind will experience auditory and visual hallucinations. You will feel as though you have separated from your physical body and are pure energy, a part of something greater. Monks practice years to reach Theta in a concious state. Do not resist. Do not get frightened. This state gives you access to insights, bursts of creative ideas – a key state for “reality creation” through vivid imagery. After 1 hour of floating, soft music will start playing inside the tank. This is your queue that the journey for now has came to an end and it’s time to go back to the reality we call society. With time you will want to float for longer and longer. I have floated for 2 hours before and even though it may sound like a long time there is no sense of time during a good float. John C. Lilly was known to float for up to 6 hours and trained himself to reach such high states that his experiences are what some people would call out of this world. I would love to hear your experience in the tank. Please use the comments section below to share your journey in the tank. Q: Will I drown if I fall asleep in the tank? A: No. You are always buoyant, floating on top of the water like a cork. Same as the dead seas. If you did roll over, the strong Epsom Salt in the water would instantly wake you up. A: For some the first time might be a bit overwhelming. You can go in and out of the tank as you please. You can use the tank with the door completely open, you can keep it partially open, or you can close it. There is no particular way to use the tank that is more correct than another. Any way you use it, that is comfortable for you, is correct. But once you relax and let go you will experience peace and tranquility and want to come back for more. Q: I did what you said to do and nothing happened. What gives. A: Practice makes perfect. Like anything in life you need to immerse yourself in it and embrace the offering. I recommend you give it a go at least 3 times and each time be open and willing to let go.